Definition at line 28 of file dispatchtypepath.h. 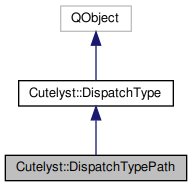 Constructs a DispatchTypePath object with the given parent. Definition at line 30 of file dispatchtypepath.cpp. Definition at line 134 of file dispatchtypepath.cpp. Definition at line 77 of file dispatchtypepath.cpp. References Cutelyst::Request::setArguments(), Cutelyst::Request::setMatch(), and Cutelyst::DispatchType::setupMatchedAction(). Definition at line 117 of file dispatchtypepath.cpp. Definition at line 140 of file dispatchtypepath.cpp. References Cutelyst::Action::attributes(), Cutelyst::Action::controller(), Cutelyst::Component::name(), and Cutelyst::Action::numberOfArgs().